I was born in the year of the Rabbit and this fabric featuring various Hares on a Linen-look cotton hopped into my shopping basket! I purchased a metre of the print from eBay and was delighted when it arrived to see that it co-ordinated well with the remnant of spotted linen look cotton left over from a dressmaking project(more of that later!). I wanted to make a large tote bag to use for attending patchwork and quilting classes that would also be robust enough when out and about shopping. I thought about the dimensions and based the main panels on the size of the “Martha” market bag which is a free pattern from the Craftsy website. From that starting point I went on my own unique path making external pockets on the bag, fussy-cutting the pocket panels and adding the contrast fabric to accent various features of the bag. 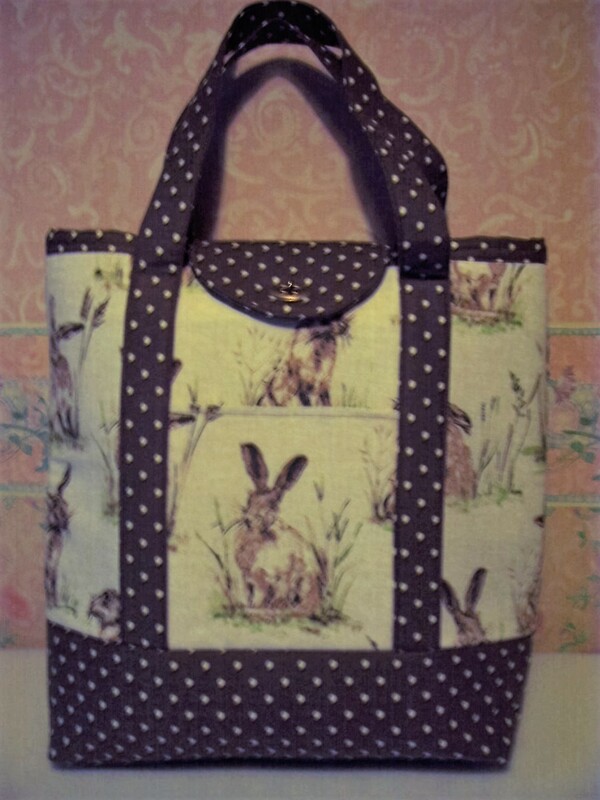 I particularly like the way that a Hare is peeping over the top of the zipped pocket on the reverse of the bag. There is a slip pocket behind both the external and the internal zipped pockets plus an internal pocket that is divided into sections to take a mobile phone, pens and pencils. I also added a loop and parrot clasp to one of the internal seams so that keys are always close to hand and don’t get lost at the bottom of the bag. The contrasting flap has a twist lock and the entire bag is padded with Bosal ® foam interfacing. As the Bosal ® makes the bag somewhat cumbersome to handle, I applied a contrast binding around the top so that I could avoid the trauma of turning through a gap in the calico lining. The final dimensions of the bag are 17” wide x 16” high x 4” deep. The handles extend by 22” and are therefore long enough to go over the shoulder. 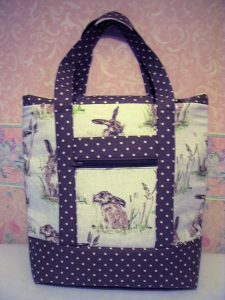 I am delighted with this bag and intend to publish the pattern and instructions – maybe for a class or workshop. 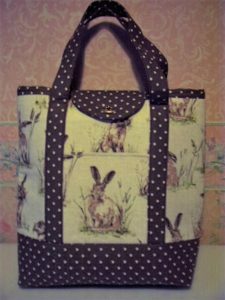 I have some more “Hare” fabric, featuring a smaller creature and plan to make a similar bag on a smaller scale – the “Midi Maggie”, followed eventually by the smallest, “Mini Maggie”. I can foresee many more “Maggie” bag incarnations in the future.